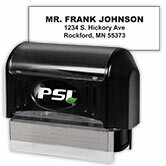 As many as 25,000 clear impressions - that's what you can expect from high quality pre-inked stamps from CheckAdvantage! Pre-inked stamps help you stay on top of things by making those mundane tasks fast and easy, and maybe even a little fun! 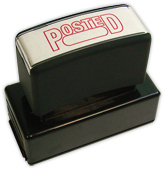 Endorse checks, put your return address on envelopes, and get your message across with a simple stamp! Plus, we offer some of the best prices on pre-inked stamps you'll find anywhere online. Get your own personalized endorsement stamps and return address stamps! 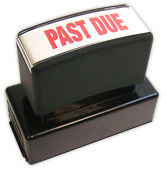 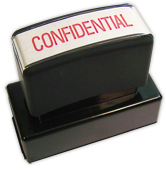 You can also choose from our wide selection of stock rubber stamps for marking documents with messages such as "Paid" or "Rush." 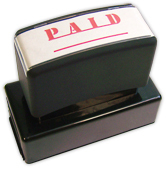 We also offer signature stamps. 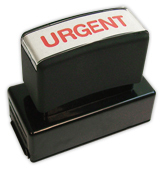 Get a pre-inked rubber stamp with your "John Hancock" on it and save time signing letters! 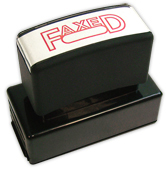 If you need a signature stamp, call us at 1-888-657-9758 for more information. Pre-inked stamps leave our warehouse within three business days. 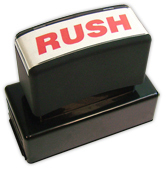 Sorry, rush service is not available on pre-inked rubber stamps.